Most tourists ride in 1st Class AC, 2nd tier AC, or 3rd tier AC but we went the cheap Indian route and paid less than $6 for the both of us to get to Delhi. 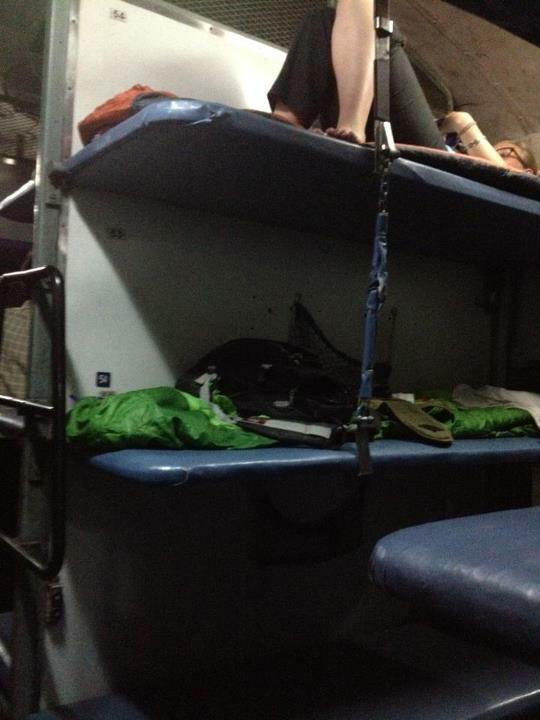 We had to hang out in the Kalka station for over 3 hours and we were the only Westerners in the entire place. Two little girls dragged me to meet their family who just smiled at me and took photos. The sleeper bed was surprisingly comfortable and I passed out for a few hours. Katy slept well too but her neighbor across the way decided to hold her hand in the middle of the night. We rolled in to the train station at 6:30am and took an autorickshaw to South Delhi where we are staying with Jeflynn, one of our new friends we met in Kasol. Back in the heat, back to trash covering the streets, and young children begging for money, but Delhi is much different than I imagined. We went to the City Walk shopping mall, the biggest shopping center in the city. It felt like walking through Woodfield back at home. I hated it. So many similar shops and fast food restaurants. My shopping addictions came back immediately as I ran around Mango and Zara and my heart ached thinking of my closet back home. For the first time I hated what I was wearing and felt the need to spend American prices on clothes that wouldn’t survive in my backpack. I left without any purchases and headed to drown my sorrows in my first Indian McDonald’s meal.The fries were spot on with real ketchup to dip, dc sadly only comes in a can, and the veggie burger tasted pretty delicious. Tonight we’re making the guys take us out on the town, crossing our fingers for a club.